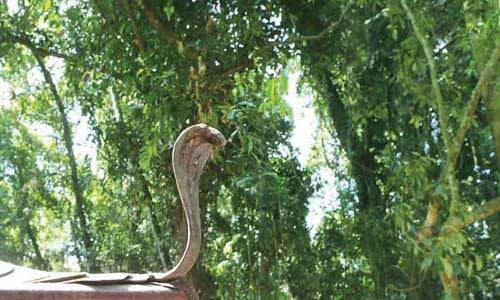 Snake worship, or Nag Aradhana (prayers at Naga Temples), is very popular in Kerala. Earlier important houses in an area had a special grove dedicated to Serpents. Even today many homes in Kerala maintain Sarpakavu (grove). 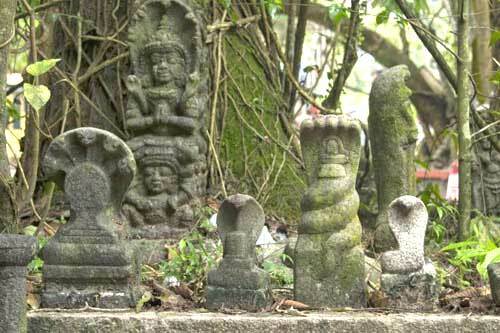 The origin of snake worship in Kerala is associated with Parasurama, the incarnation of Lord Vishnu. The story also explains why Kerala has numerous naga temples including the famous the world famous Mannarasala Temple. Sarppakavu, or the abode of Snakes in Hindu homes, reminds of the importance of living in harmony with nature. It is believed that after killing 21 generations of Adharmic Kshatriyas, Parashuram threw his axe into the sea. Sea withdrew to space where the axe fell and the land thus formed is Kerala. Parashuram invited people to settle in the new land but they could not stay at the place due to salinity in water and snakes. Parashuram then prayed to Shiva to find a solution. Shiva asked him to propitiate Snake Vasuki and Nagaraja Ananta. Parashuram performed intense austereis and was able to please Vasuki and Ananta. They appeared before him and asked to make Snakes the protectors of new land and build sacred spots for them. If this is done then Snakes will not harm people. Thus snake worship became part of many homes in Kerala. The serpent's using their breath removed the salt content from water and thus the region became hospitable for people to live.